Corporations get enormous benefits that regular “persons” do not. One of the biggest is limited liability. This means that the shareholders are not liable for the debts of the corporation. A corporation can get in a lot of trouble, financial and otherwise, and then just close up shop, divide its assets to its creditors, and the shareholders can just walk away losing only the money they originally put in. While it might be a “person” to certain members of the Supreme Court, there is no person to be made to work off the debt or to put in jail. And of course, corporate “persons” never have to die. In return, we the people of the United States ask corporations to pitch in to help pay for the roads and courts and schools and scientific research and government contracts and the rest of the things that have helped make them the prosperous entities they are. But a number of American corporations are so fed up with the idea that should pay their taxes that they are actually renouncing their US citizenship. These corporations are “leaving” the US to dodge taxes—but their executives, employees, offices, stores, customers etc. are still here. The only thing that is really leaving the country is the requirement to pay US taxes. These corporations are able to “leave” the US by engaging in something called inversion. Explaining an inversion is a bit complicated. A US company buys or merges with a non-US company, and the result is that the US company can be considered to be a company from the other country. But at the same time the company keeps most of its operations, etc. inside the US. The result is that it might still owe taxes on income reported as made in the US, but it owes no taxes on income elsewhere. Here are five companies—only a handful of the total — that have or are trying to renounce their US citizenship to avoid paying taxes to help cover the benefits they receive. 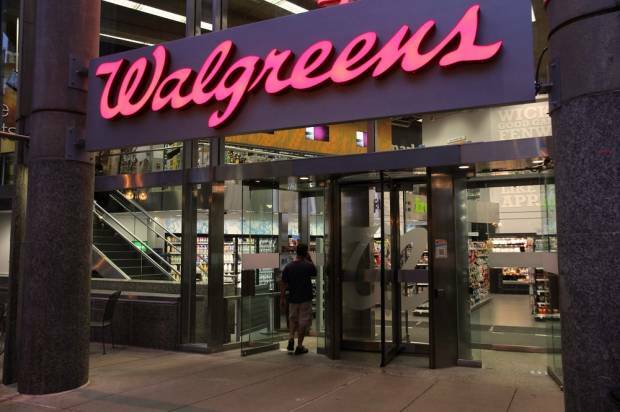 Walgreens is the US’ largest pharmacy retailer with 8,200 stores and locations in all 50 states, and the company is currently deciding whether to renounce its U.S. corporate status and instead claim on paper to be a Swiss company. According to Americans for Tax Fairness, this move would mean Walgreens avoids paying $4 billion in US taxes in the next five years. Medtronic Inc., a medical device maker with $17 billion in annual sales, is in the middle of purchasing Ireland’s Covidien for $42.9 billion as a tax-avoidance scheme. Both companies are in the medical device business, but analysts and investors have said the deal makes sense largely because Medtronic can tap its $12 billion in overseas cash without paying United States taxes. Medtronic has been keeping its non-US profits “out of the country” to avoid the taxes it owes on that money. Now it is using the funds to buy itself out of the US for good. Of course, it will still have the same offices, employees and customers here. Our tax laws let it get away with this. Usually a company claims it is doing this “for the shareholders.” But in this case it is going to cost Medtronics’ shareholders big-time. The IRS is going to declare this counts as shareholders selling their Medtronics stock, and will hit them with a tax bill for the gains. However, Medtronics executives will have their tax bills covered by the company. American manufacturer Ingersoll-Rand Co. (IR) forged the tools that carved the Panama Canal and shaped Mount Rushmore. When it shifted its legal address to Bermuda in 2001 to reduce taxes, the maneuver sparked bipartisan outrage in Congress. … Ingersoll-Rand continues to score federal work worth hundreds of millions of dollars, touting projects for the Army and Navy in sales brochures. The company’s strategies have even included trying to piggyback on the eligibility of other companies, according to two former Ingersoll-Rand employees. In March 2010, an Ingersoll-Rand unit received a contract to maintain equipment at supermarkets on military bases from Texas to Hawaii. Funded by a 5 percent surcharge on purchases at the stores, the contract has already paid more than $100 million, according to data compiled by Bloomberg. Here is one with a lot of gall. Eaton took $90 million in taxpayer-financed subsidies to build a headquarters in Cleveland, then moved itself to Ireland to avoid paying US taxes. But Eaton and its CEO are part of the notorious Fix the Debt campaign, a campaign to persuade Congress to cut Social Security and impose austerity on 99% of us — because the US doesn’t collect enough in taxes! That’s right, a company that claims to be Irish to avoid paying US taxes is lecturing Americans on how we need to cut back on the things government does for us. Fix the Debt says we have to do this because of a shortfall in tax collections… from companies like Eaton! In 1952, about 32% of federal revenues came from the corporate tax, 42.2% from the individual income tax, and 9.7% from the payroll tax. Today, the individual income tax still accounts for nearly the same percentage, but the corporate tax has declined to 8.9% of tax revenue and the payroll tax is up to 40%. Seen in that light, payroll taxpayers–that is, America’s working men and women–have financed the decline in the corporate tax burden (which benefits mostly wealthy shareholders). One thing we should do is push for passage of legislation introduced by Sen. Carl Levin and Rep. Sandy Levin (both Michigan Democrats) that would make it harder for American corporations to merge with foreign corporations in a way that enables them to operate as if they are American corporations while claiming to be foreign for tax purposes. In early July the House passed an amendment by a vote of 221-200 denying federal contracts to American companies that have reincorporated in Bermuda or the Cayman Islands. This is not yet law, but is attached to the Energy/Water appropriations bill. It is a beginning, but only lists these two tax haven countries and won’t affect Walgreens, should it make itself appear to be a Swiss company. Republicans will obstruct the bill. The Joint Committee on Taxation estimates that the legislation would save $19.5 billion over 10 years. This would be a start toward fixing this problem. A small start, admittedly, but a start.